Telestack has recently installed and commissioned a mobile materials transfer and shiploading system for coke loading at Port Kembla in Australia. Before the installation of Telestack’s mobile equipment, the customer moved metallurgical coke stock from the point of production to a dedicated berth, which was a 50-minute round trip. The material was then stockpiled before being picked up and transported to the shiploader. The customer then moved to skip loading from a berth which had recently become available due to a reduction in steel export activity. This eliminated the 50-minute transport leg and the double handling of the brittle material. However, it was labour intensive and consequently very expensive. loaders. The TU815 had also been successfully employed as a replacement for permanent reclaimers during breakdowns and scheduled shutdowns, reclaiming iron ore, coal and iron sands with rates in excess of 800tph. The client envisaged a system that would deliver met coke to Handymax vessels at a rate of 400tph (tonnes per hour). To achieve, the client wanted to utilize its existing TU815HD mobile truck unloader to feed the new shiploader. However due to a cycle time of approximately five minutes per truck tipping and a nett weight of trucks of 20 tonnes of coke, a second truck unloader was required. The Telestack TU1015R mobile truck unloader was bought with variable speed on the hydraulic pump to drive the feeder, allowing the client to alter the speed depending on the material being handled. The range of materials being handled varied from 0.45t/m3–2.8t/m3 density. This feature proved invaluable to allow the operators to control feed rates to the shiploader. When designing the shiploader,Telestack engineers were faced with several application challenges which they had to overcome. overall weight restrictions — yet at same time complying with local Australian standards. Therefore, a unique design was manufactured to overcome all of the above challenges. The TS1242 radial telescopic shiploader incorporated full dust suppression features including removable undertrays, telescopic dust covers and a cascade chute with a trimmer at the end. The cascade chute allows for the soft loading of the material and the trimmer enables the operator to easily reach under hatch coaming when finalizing the loading process. This, along with the standard feature of a 17-metre telescopic boom, allows for effective trimming. The shiploader also incorporates a variable-speed drive on both the inner and outer conveyors to cater for material ranges in density and also accommodates soft transfer point loading to minimize degradation by reducing belt speeds. The shiploader also had 1,800mm-diameter radial wheels at the front to minimize loading at the jetty due to weight restrictions. The unit is fully self contained and fully mobile with an onboard 180 kVA enclosed Cat genset with full remote control of functions. Using the new equipment, the client has successfully loaded Handymax vessels for nearly a year now. When the shiploader is not in use shiploading, the client can remove it from the berth for routine maintenance and washdown, leaving the jetty free for other port activities. 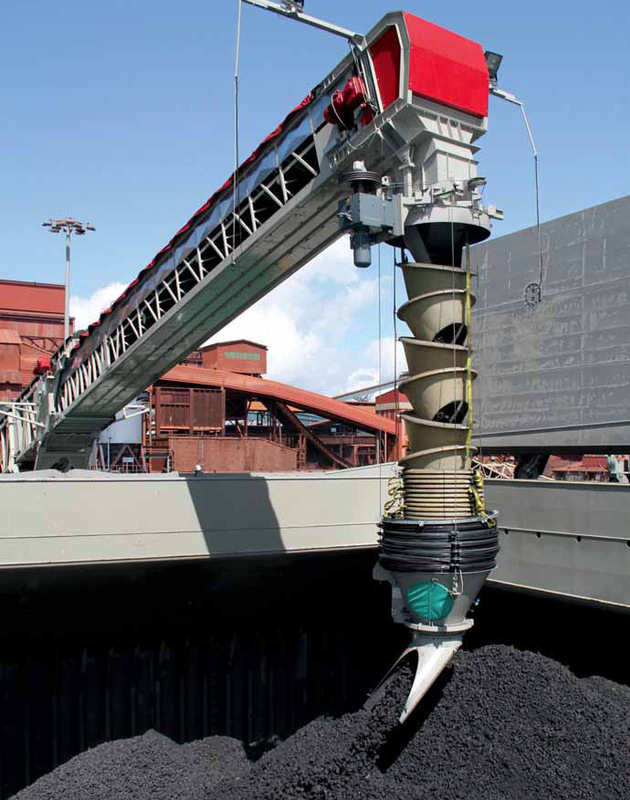 Telestack offers a range of mobile bulk material handling solutions which are in operation across the globe handling materials such as coal, iron ore, aggregates, fertilizer, grain etc in mines, ports, quarries, power plants, steel mills and cement kilns.